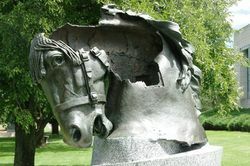 A sculpture of a bronze horse head mounted on a tear-shaped granite plinth commemorates all animals that have served alongside Australians in all conflicts. The bronze head was originally a part of the memorial dedicated to the Australian Light Horse Brigade and the New Zealand Mounted Rifles in Port Said, Egypt which was unveiled by Australian Prime Minister, Billy Hughes in 1932. During the Suez conflict on December 1956, the statue was attacked and destroyed by rioters and later the remaining pieces were return to Australia and became part of the War Memorial`s collection. Charles Web Gilbert won the design competition for the original monument in 1923 but died before it was completed. This memorial was unveiled on 21 May 2009 by the Hon. Alan Griffin MP, Minister for Veterans` Affairs. It commemorates those animals that served alongside Australians in all conflicts. Animals as diverse as horses, dogs, donkeys, camels and pigeons performed many essential duties, such as transport, tracking and carrying messages ; some also lived with the Australians as mascots or companions. To this day, animals continue to play an important role in the work of Australian armed forces. The memorial incorporates a bronze horse`s head, the last remaining fragment of Charles Web Gilbert`s original Desert Mounted Corps memorial, which stood at Port Said, Egypt until it was destroyed during the Suez Crisis of 1956.